Oil is often seen as the root cause of conflict in the Middle East, but in the coming years water might come to overtake it as a key source of dispute. 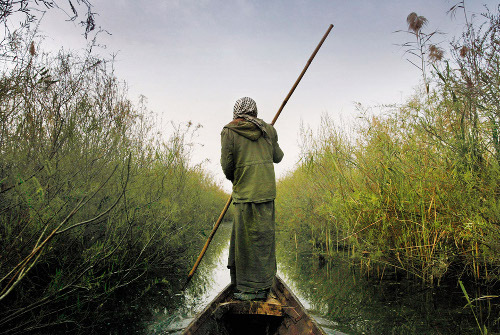 A Marsh Arab poles his canoe through Kirmashiya Marsh in southern Iraq. Photo by Joao Silva. Mesopotamia, the ‘Land of Two Rivers’, cradle of modern civilization and currently home to probably as many conflicts as there are ethnic groups, religious factions and nation states. Rebels fighting states, Sunnis battling Shias, Turks clashing with Kurds, jihadists massacring local villagers, environmental activists against national governments and states competing with one another for the region’s natural resources. Where oil is widely considered to be one of the main causes for the region’s instability — mainly because it drew imperialist powers to the region that eagerly supported local dictators to ensure continued and unlimited access to the precious liquid — another potential source of conflict is often overlooked. Water, the first and foremost source of life in the barren desert regions of the Middle East, which allowed for the world’s first civilizations to develop on the fertile floodplains between the Euphrates and Tigris rivers, is becoming ever more scarce, and the struggles to safeguard a fair share are growing fiercer by the day. Water flows. From the mountains to the seas. Oblivious to national borders, local conflicts and the religious, ethnic and ideological backgrounds of the people who populate its banks. Rivers that sprout in one country quench thirst in another, and as such, by definition, they play in important role in the relations between the countries whose borders they so easily cross. On several occasions over the past decades local development projects on the Euphrates and Tigris rivers have brought the three neighboring states Turkey, Syria and Iraq to the brink of war. When in 1990 Turkey blocked the flow of the Euphrates for nine days to fill the reservoir of the Atatürk dam, Iraq massed troops on its border and threatened to bomb the dam. Nowadays, tensions remain high as yet another Turkish mega-dam is about to be completed — the Ilisu dam on the Tigris river — which will severely reduce the water flow to Iraq and destroy thousands of years of cultural and historical heritage at home. Water is cause for conflict in many instances, but it also has the potential to bring communities together to build the necessary foundations for lasting peace in the Middle East. A successful international campaign temporarily halted the project in 2009, when a number of European financiers withdrew their support after it was exposed that Turkey failed to meet the international standards of dam-building set by the World Bank to protect the environment, affected people, riparian states and cultural heritage. However, after Turkey turned to its national banks to provide the necessary funding, the project is now back on track and is set for completion this year. Once completed, the Ilisu dam will provide approximately 2 percent of the national electricity requirements — an amount that can easily be provided by other, less destructive means, such as the upgrading of the country’s outdated transmission lines. Also, in combination with the nearby Cizre dam the Ilisu dam will serve to irrigate agricultural land, bringing much needed development to the region and providing employment opportunities for the impoverished population. At least, that is what the Turkish government would have us believe. More skeptical minds see a correlation between the large number of mega-developmental projects that have a devastating effect on local culture, society and the environment; the fact that a large number of these project take place in Kurdish dominated areas; and the neo-Ottoman aspirations of the current government that dreams of reinstalling Turkey as the dominant power in the region. For years, the Turkish central government, led by the former prime minister and current president Erdogan, has claimed that there is no such thing as a “Kurdish problem”, denying the fact that the country’s Kurdish population has been discriminated against on the basis of its ethnic background, and arguing that the Kurds’ hardships stem from the underdevelopment of their traditional homelands in southeastern Turkey. The logical conclusion following this line of thought is that economic development of the predominantly Kurdish regions in the southeast of the country automatically eliminates all grudges the Kurds could possibly hold against the Turkish government. In its pursuit to pacify the country’s Kurdish population, the GAP project is only partially successful — and not because it has brought the supposedly much-demanded development to the region. Many locals in the affected areas perceive the GAP project in general, and the Ilisu Dam in particular, as a well-thought-out scheme designed to undermine social cohesion, relocate farmers and villagers to regional urban centers, and form a “natural” barricade against the Kurdish militants of the PKK. Across the region it is common policy for the government to pay the forcefully displaced locals the market value of their houses and plots of lands in compensation. People are then offered alternative housing in nearby settlements, newly constructed for the purpose of relocation. However, rather than being offered these houses as compensation for the loss of their homes and livelihoods, they are sold to the locals for as much as 7 or 8 times the price of their old homes. Displaced locals are then left with no choice but to either indebt themselves to the government for the next twenty years or more to pay for these new homes — which they never wanted in the first place — or to leave for the urban centers where families end up on the outskirts of town, in municipal housing projects forced to make a precarious living from underpaid day jobs. The GAP project has so far displaced hundreds of thousands of people who have been silenced, pacified and left powerless, their demands for fair compensation ignored and their voices silenced as they joined the precarious masses in the urban centers, competing for the chance to be exploited because an unfair wage is better than no wage at all when you have hungry mouths to feed. It’s not just within Turkey’s national boundaries that the GAP project has caused consternation. The Euphrates and Tigris rivers both originate in Turkey, but whereas Ankara considers them to be a source of national wealth and an instrument for regional development, they are the very sources of life for its southern neighbors Syria and Iraq. International law requires Turkey to consult its co-riparian states before starting the construction of big dams that will affect the flow of water, but on many occasions it has failed to do so. The first disputes between the three nations date back to the 1960s, with the start of large-scale water development projects in the region. In 1975 Iraq and Syria massed their respective troops on the border after the completion of the Syrian Tabqua dam on the Euphrates, and in 1990 Turkey cut off the flow of the river for nine days to fill the Atatürk dam reservoir, leading to protests and threats from both Syria and Iraq who claimed that they hadn’t been informed of the plans. The finished GAP project will reduce water flows to Syria by 40 percent, and to Iraq by a shocking 80 percent. This, in combination with the severe droughts that have hit the region over the past few years, the ongoing conflict between the Iraqi state and it allies and the militants of the so-called Islamic State, and the millions of (internally) displaced people in the region, has the potential to unleash an environmental and humanitarian catastrophe that could cause a serious food security problem, destabilizing the region for years to come. The case of the Ilisu dam represents in a nutshell the importance of water and the many different shapes that political issues can take when it comes to question of ownership, access and control of natural resources and river flows. The Euphrates and Tigris rivers, as many of their tributaries, are a source of life as well as conflict. They irrigate arid plains and make life possible where otherwise none could have flourished. At the same time, they can be exploited to push certain agendas, break up communities, and use as leverage in political negotiations. Most importantly, however, they have the potential to bring sustainable peace to the region. With the region in flames, the Syrian civil war continuing unabated, the militants of the Islamic State proceeding to launch attacks on multiple fronts — most recently with the capture of Ramadi, a city on the banks of the Euphrates in Iraq’s central Anbar province — and the Kurdish peace process in Turkey threatening to derail, the need for cooperation between states, and more importantly, between communities, is now more urgent than ever.